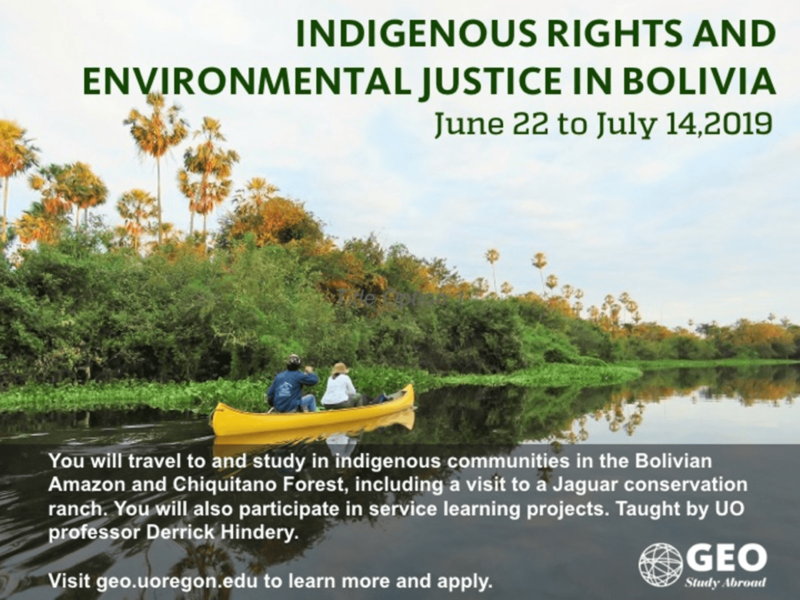 Next summer I’ll be leading the University of Oregon’s Environmental Justice and Indigenous Rights study abroad program in Bolivia. I’d like to invite you to apply. The final deadline for applications is March 15. We’re very excited to launch the program this year. It will be a great mix of learning about environmental justice and indigenous rights, working on community-engagement projects prioritized by Guarayo and Chiquitano indigenous peoples, and fun activities like visiting a jaguar conservation ranch and bio reserve as well as art, dance, music, games and local sports. I’ve collaborated with the Chiquitanos and Guarayos for 20 years. We are looking for a small group of students who are as adventurous as they are thoughtful. Please feel free to share this message and invite others to apply. CLICK HERE to see the website. Be sure to check out the updated photo gallery and information about scholarships and financial aid! Since the insurance covers the weeks before and after, we highly recommend you tour Bolivia while you’re there. Some ideas are wildlife tours in the Amazon or visiting the world famous Salar de Uyuni salt flats. We didn’t include these visits so as to keep costs down but they certainly are an option. I’d be happy to connect you with indigenous and non-governmental organizations in Bolivia if you’re interested in an internship or the like after the program or just in general. Remote work from the U.S. or wherever you are would be a possibility too. International Studies majors can fulfil the 10 week field learning experience this way. If you have any questions, please contact me or Crystal Galarza, the program advisor (cgalarza@uoregon.edu). Thank you for your interest in the program!